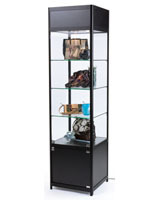 This illuminated narrow storage tower features economy construction without sacrificing either style or usability. 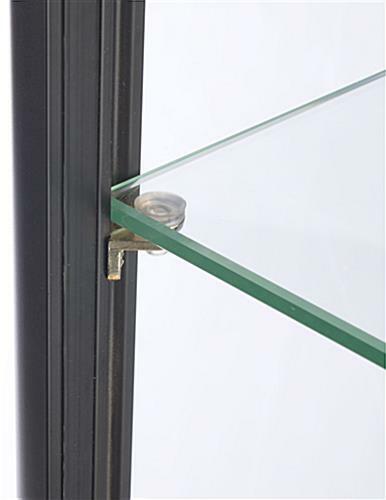 Standing 72" tall, each high visibility showcase has neutral finish aluminum framing with sturdy MDF base and canopy. 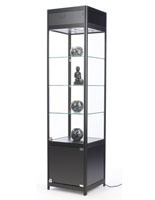 This black framed narrow storage tower is made using impact and shatter resistant tempered glass for safe use in high traffic, public environments. 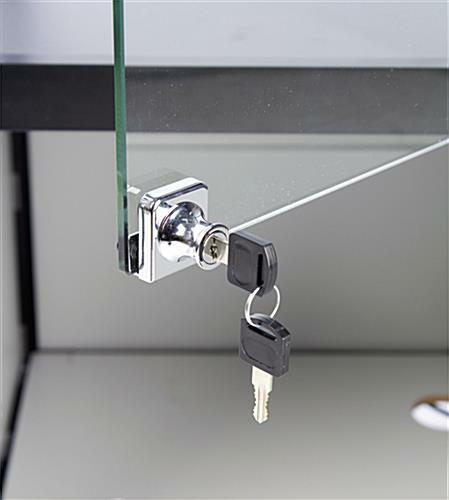 Each cabinet includes adjustable-height shelves, halogen top lights, a swing-open access door, and locking base cabinet. 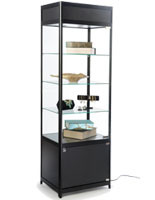 This 3-shelf narrow storage tower with toplights features an 18" wide square display case. 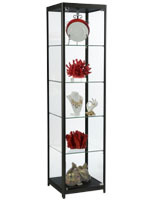 This economical merchandise display fixture is perfect for use in retail stores, commercial businesses, galleries and museums, schools, or private locations. This top-lit storage tower offers high visibility in any environment due to the built in overhead halogen lights. 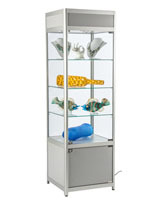 Each three-shelf display cabinet allows the shelves to adjust independently to accommodate a wide variety of merchandse sizes. 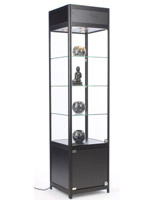 This sturdy glass storage tower with tempered glass showcase and locking access doors is an ideal choice for public areas, and will complement any decor. 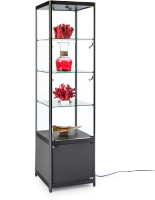 Please Note: Most retail store showcases are around 76" tall, however, this case is 72" tall and will not match the height of "standard" fixtures. 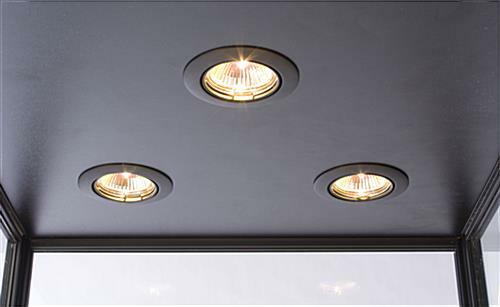 18.0" x 72.0" x 17.5"
17.3" x 16.5" x 17.0"